Since 1992, the European Union has imposed increasingly strict limits on emissions from cars through what are called ‘Euro’ standards. Euro 6 is the latest version of these standards, and from 1 September 2015 all new cars have had to meet its limits. A Euro 6 car produces just a tiny fraction of the pollutants emitted by a Euro 1 car, and much less than those from a Euro 5. Euro 6 standards impose the toughest vehicle emissions limits yet, pushing the boundaries of emissions technologies to produce ever-lower levels of the exhaust pollutants that impact air quality. Diesel particulate filters (DPFs) capture 99% of all soot particulates, and have been fitted to every new diesel car since the introduction of Euro 5. NOx emissions have also been drastically reduced, with innovative emissions technologies seeing levels fall 84% since 2000. Does my car meet Euro 6? You can find out whether your car meets Euro 6 standards, by entering its details into the emissions look-up tool on the Vehicle Certification Agency (VCA) website or by contacting the manufacturer. 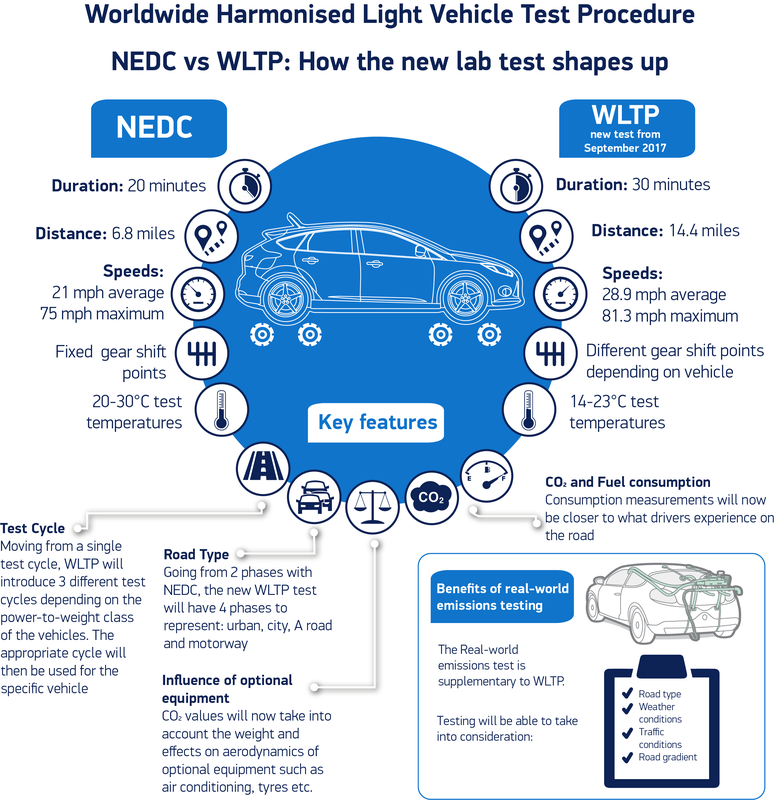 The new lab test is called the Worldwide Harmonised Light Vehicle Test Procedure (WLTP) and is longer, faster and more dynamic than ever before. The WLTP test procedure has been designed to better represent modern day driving situations, and replaces the previous New European Driving Cycle (NEDC), which has become outdated with the changes in vehicle technology and traffic conditions. In addition to the WLTP test is an on-road test called Real Driving Emissions (RDE), also being introduced for the first time, which ensures that the vehicle also performs under the many and varied conditions involved in ‘real-world’ driving such as speed, congestion, road conditions and driving style. WLTP will provide much more accurate basis for determining a car’s fuel consumption and emissions. 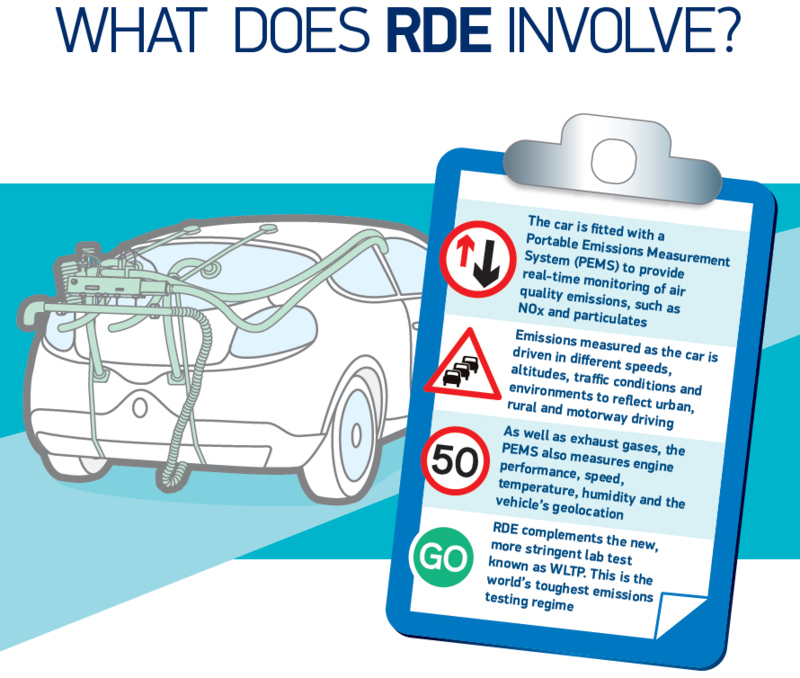 The WLTP is complemented by an on-road test called Real Driving Emissions (RDE), which will ensure the vehicle’s lab test performance is matched on the road. RDE works by fitting equipment called a Portable Emissions Measurement System (PEMS) to the vehicle, which measures emissions while the vehicle is driven on the road. Given the huge differences in temperature, road and vehicle conditions as well as driving styles, no lab test can ever replicate exactly what happens on the road. 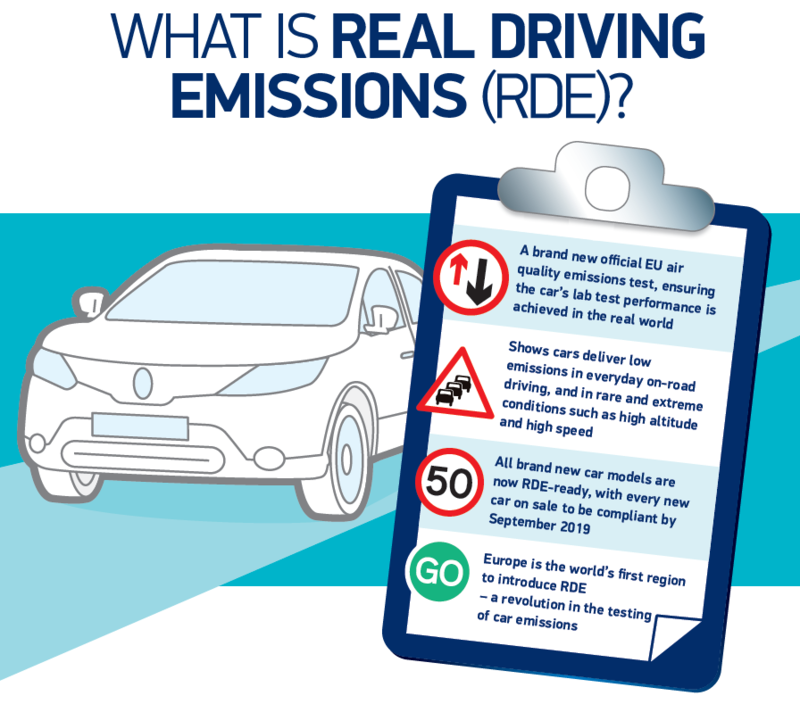 RDE testing will demonstrate that new cars’ low emissions are achieved in these real world conditions. RDE will also include some extreme driving conditions, rarely encountered by most motorists, for example carrying a heavy load up a steep hill at high speed in very low temperatures. To allow for the margins of error in highly sensitive PEMS equipment and the test itself, there is a tolerance allowed on top of the laboratory limits – known as the conformity factor. If the vehicle meets these requirements it will be approved for sale in Europe. Why are cars emissions tested? All new cars must undergo strict official measurement of their CO2 and air quality emissions before they are approved for sale. Until September 2017, this involved a single test known as the New European Drive Cycle (NEDC). The test, which was designed back in the 1980s, took place in a controlled laboratory environment to provide consistent benchmarking information so vehicles could be compared against each other, wherever they were tested. What are the conditions of laboratory testing? Just as with previous NEDC test, the new WLTP test is carried out in a controlled temperature and environment, and the car must be representative of the vehicle as it is produced. All of the vehicle’s components must be present and cannot be tampered with. The vehicle will be checked to ensure it has the same tyre pressures, fluid levels and components as it would have on the road. The EU test operates in strict conditions and is normally witnessed by a government-appointed independent approval agency. In the UK, this is the Vehicle Certification Agency, which is responsible to the Department for Transport. Do manufacturers publish figures from the lab test? Manufacturers are required by law to publish the official lab test figures for each of their vehicles’ CO2 emissions and miles per gallon. This ensures that consumers can make reliable comparisons between vehicles, based on figures produced through a tightly controlled, repeatable test. For other emissions such as NOx and PM, the lab results are used in a pass/fail test to determine whether a vehicle meets the official EU emissions limits in order for it to be sold. Again, the strict conditions of the lab test ensure that the results are scientifically robust and truly comparable. Why was the test changed? The previous NEDC test was last updated in 1997, and over the past 20 years, vehicles have advanced at a rapid rate, with high tech safety and comfort features, from electronic stability control, parking sensors and airbags, to air conditioning, heated windscreens and electric seats now increasingly fitted as standard. However, the way they were tested did not keep pace, resulting in a gap between performance in the lab and on-road where fitment of these in-car technologies can differ across models, and conditions such as speed, congestion, road surface and driving style, can vary from journey to journey and driver to driver. EU regulators and national governments have been working, with the support of the automotive industry, to address this by making testing more relevant to modern vehicles and consumer needs.